In 1997 he attended the” Taller de Lauderia” at the Universidad Veracruzana in Xalapa, México under the guidance of violin maker Antonio Amezcua and bow maker Octavio Aranda. 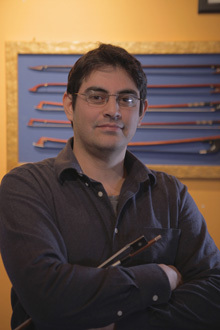 In 2003 he attended a three year bow making course in Cremona, and in 2004 starts an apprenticeship with the departed Master bow maker Giovanni Lucchi developing his skills as bow maker and restorer, becoming workshop responsible over the years until he opened his own workshop in 2011. Becomes workshop teacher of the bow making course at Cr forma in 2009. “Violin: Soul and Shape” International Violin Makers Competition. Moscow.